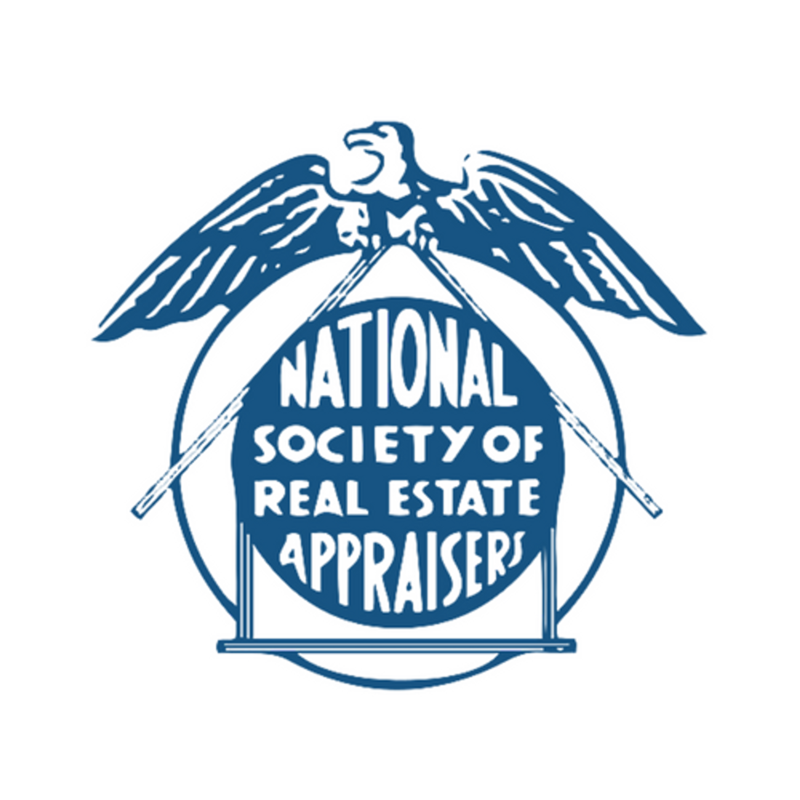 The National Society of Real Estate Appraisers, Inc., (NSREA), was organized in the State of California in 1956 as an affiliate of the National Association of Real Estate Brokers, Inc. The following men have been identified as the original founders: Fred Curls (MO), William Harps (DC), George S. Harris (IL), T. H. Mayberry (MO), Ripley B. Mead, Jr. (IL), Henry Morrison, Jr. (MI), Hershell Phillips (MI), Selmer Prewitt (OH), James A. Riggs (MI), P. C. Robinson (MO), Robert “Buddy” Spivey (CA). The organization was named The National Association of Real Estate Appraisers, Inc. and was amended in 1958 to The National Society of Real Estate Appraisers. The founders chose Michigan as the state of incorporation with the following officers of incorporation: George S. Harris, F. Henry Williams W. D. Morison, Jr. and W. B. Muse. The first members of the Board of Directors were George S. Harris (Chicago, IL), F. Henry Williams (Jacksonville, FL), W. D. Morrison. Jr. (Detroit, MI), James D. Riggs (Chicago, IL), William Harps (Washington, DC), T. H. Mayberry (St. Louis, MO), M. M. Bonner (Louisville, KY), Henry W. Morrison (Detroit, MI), Robert N. Landrum (Chicago, IL), Selmer E. Prewitt (Cleveland, OH) and Lorenzo V. Spencer (Los Angeles, CA). 1. To be an affiliate of the National Association of Real Estate Brokers, Incorporated, and to provide the members, of the National Association of Real Estate Brokers, Incorporated, with an opportunity for study, and certification of merit, in the field of real estate appraising and its various allied fields of appraising. 2. To formulate courses of study, formulate rules of ethics and professional conduct, and to enforce such rules upon and for its members. Members were not looking for a handout or free ride; but, instead, a way to level the playing field for its members by forging partnerships with progressive minded lenders, employers and appraisal services. Majority appraisal organizations would schedule their courses in exotic places like Hawaii and it was very difficult for the majority of people interested in the field to follow a complete course of study. NSREA was very successful in its outreach efforts to assist interested appraisers breaking into the field. NSREA members are primarily located in urban areas across the nation and are recognized as specialist in urban appraising, however, NSREA would take its courses to areas where the need for course work was vital such as Louisiana and Mississippi and many of the first generation of appraisers in these areas were first introduced to appraisal course work by NSREA’s instructors. appraisal organizations that offered clients the most protection. NSREA participated as a full partner with a consortium of eight American appraisal organizations and the Appraisal Institute of Canada in the formation of the Appraisal Foundation. The objective of the Foundation was to upgrade appraising to a professional level through the establishment of higher education and experience requirements. This effort was a precursor to the Uniform Standards of Professional Appraisal Practice which governs the practice of appraisal today and led to the requirement of state licensing of appraisers. The charter members of this appraisers’ self-regulatory organization (SRO) were the National Society of Real Estate Appraisers, the American Institute of Real Estate Appraisers, the American Society of Appraisers, The American Society of Farm Managers and Rural Appraisers, the International Association of Assessing Officers, the International Right of Way Association, the national Association of Independent Fee Appraisers and the Society of Real Estate Appraisers. Initial funding for the non-profit Foundation was provided by these founding groups. When the foundation and NSREA was subsequently hit with a lawsuit claiming violation of antitrust laws, the cost of litigation to NSREA necessitated withdrawal from the foundation. A plan is currently underway to rejoin the foundation and is expected to be accomplished by 2008. When HUD abandoned its roster in 1993, African American appraisers experienced some respite in the struggle for equal opportunity as members of the FHA and VA Fee Panels and as fee appraisers for banks participating in the Community Reinvestment Act (CRA); however, the dismantling of the HUD Fee Panel in 1993 and changes in the administration of the CRA brought some members’ appraisal practices to a screeching halt. NSREA held its first annual recertification conference in 1985 originally holding its conferences in conjunction with its parent organization, NAREB. In 1989, the board voted to hold the annual recertification conference in January and separately from NAREB. It is projected that this change was necessary in order to meet the education needs of its membership. These meetings were characterized by the inviting of industry professionals who could offer members job opportunities and the provision of a course of study which helped designated members qualify for recertification. Today, these courses are submitted to state regulatory agencies for approval and attendees are provided with continuing education credits. Memorable meetings have been held in Ocho Rios, Jamaica, Charleston, S. C., Las Vegas, NV, Biloxi, MS, Tampa, FL, Chicago, IL, and Houston, TX among other places. NSREA’s instructors are among the best in the nation. After the FHA fee panel was dismantled in 1993 and to assist appraisers in qualifying to perform FHA appraisals, a cadre of instructors worked in partnership with the Appraisal Institute to present the FHA course across the nation. At its annual recertification conference held in Charleston, S. C., they worked with the Employee Relocation Corporation (ERC) to present the relocation course. These accomplishments were significant because of the stringent requirements held by both FHA and ERC for its appraisers. NSREA was nominated as a Best Practice Organization, by the US Department of HUD for its participation in the Single Family Examination Task Force. NSREA was the trendsetting authority on the Urban Appraising: Complex Properties course which helped practitioners understand the complexities of performing appraisals on inner city properties where mansions could often be found lying adjacent to shacks or on commercial strips. Jack Friedman, P.D. and co-author of the book, “Income Property Appraisal and Analysis” was a member of NSREA and one of its premiere education consultants. industry, identifying current and potential problems affecting the membership and establishing common grounds where the associations may work together as a single entity in solving these problems. Early on, NSREA, ASA, IFA, IAAO and IRWA were members of the Council of Appraisal and Property Professional Societies (CAPPS) and worked to bring other organizations into the fold. Former NSREA President Otis L. Thorpe, was an original member of the Qualifications Board of the Appraisal Foundation, and is the only African American to have served on either the Qualifications or Standards Boards. attorneys, mortgage brokers and other organizations in the real estate industry throughout the nation. Aside from the excellent networking it provided, a principal focus was to provide members with business opportunities. He held most of the offices in NSREA including President and served from his office at 1265 East 105th Street, Cleveland, OH 44108 until a few years before his death. Plans are underway to convert this building as a historic place for NAREB/NSREA. The NSREA Education Foundation, a not-for-profit 501(c)3 corporation was organized in 1995 to provide real estate educational opportunities for African Americans. As part of the foundation’s mandate, a scholarship program was developed. The first scholarship was awarded during the 40th anniversary recertification conference in Houston, TX. Tax deductible contributions can be made to the foundation and any appraiser intern or individual desiring to enter the real estate profession may apply to the foundation for a scholarship. Today, the mission of NSREA is to provide exceptional services for its members in the core areas of education, designation, training/mentoring, communication, recertification and business development. The purpose of NSREA is to formulate rules of ethics and professional conduct, and to enforce these rules for the benefit of its membership, and those desirous of joining the society.